Mom Tribe, where are you? I need your help! I’ve always said that this mothering gig is really just an experiment. Granted, it’s the most important and greatest experiment of our lives, but nobody really has all the answers. Everyone has their own version of an experience to share. Well, here’s mine about the words that so easily fly around our children’s precious ears. So let me start by saying we’re not the cussing kind (if you do, I have nothing against you-we can still be friends). So then it’s pretty safe to say, my kids are very naive to the language. I do remember though a time when Aden was afraid to say the word “as” because he thought it was a curse. Oh, and I’m aware that simply because it’s outlawed in our home, they’re really gonna have an itch to say them (most likely in whispered giggles). So with Aden, I told him “get it out of your system and just say it” he was horrified at the thought, and Autumn wanted desperately to use her middle finger, so I let her have at it. Turns out, when given permission, it’s not all that fun. It seemed pretty silly to them after it was no longer forbidden fruit. Recently my son was out playing with the neighborhood kids, not that I heard anybody saying anything bad, but I stood there and listened for a bit, (you know I’m talking about, I know you do it-I was just listening to hear what they talk about when parents aren’t around). Then I wondered to myself, “What would you do if you heard them curse“? Would I immediately call him into the house, before their words had a chance to sink into his ears, and have a discussion with him? Or would I let it go for a little bit and wait to see how he chooses to respond? We feel as he becomes older he’ll need a little space in order to flex his independent thinking, and ability to make good decisions. There’s going to be a time when he’ll be able to go out alone with his friends, without us, and he needs to consider the person he wants to become, and these little steps will help him. I know my son, I know he’s not comfortable with that language, I know he’s not interested in talk like that, but he has to know it too. He must become secure enough in himself to be able to resist what’s uncomfortable to him. Letting go is a process (certainly not a process I really want to go through), one baby step at a time is how we have to get through it. Have you been through this already? Please, share what you’ve discovered with me! I love learning from my community of friends here. I love this reply. 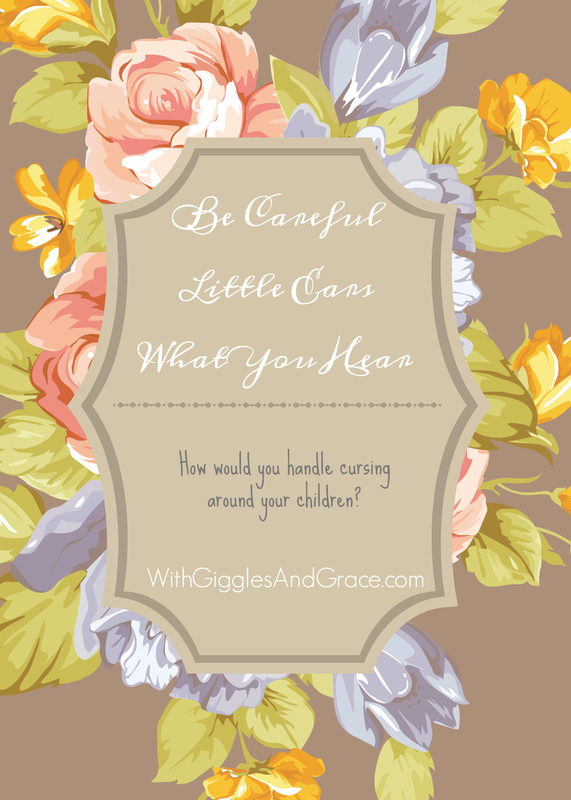 We don’t curse either and while there have probably been very few occasions that my four year old or two year old have heard major swear words they have heard other expressions that we don’t use in their household. My four-year-old will look to me and say hey, we don’t say that do we mama? That brings me some peace that we are leading and guiding them in the direction that we feel is best for us and the way we believe edifies the Lord. I want to be proactive but also be able to let go when it’s appropriate! Same here, when my daughter hears “shut up!” she whips her head around waiting for my reaction. So, you’re right, if they know what not to say, then I can have some comfort in knowing that they are at least aware of what are “good” and “bad” words. When my kids were smaller I tried harder to be mindful of the words we said around them, but occasionally we said inappropriate things. Now that they are 11 and 14 – we don’t mind our words so much. We have taught them that we don’t care how they talk to their friends but they are not to curse in our house, my husband and I try hard not to curse. I’ve always told me children that if they use bad language people won’t want to talk to them. It’s good that they know that certain words are not to be used around their parents. This also probably tells them (in not so many words) that you two are parents and not to be confused with friends out on the street-Boundaries. Thanks so much for sharing your perspective. I love this connecting! I have quite a few thoughts on the matter. First of all, I cuss (wish I didn’t but maybe someday I’ll straighten that out). Secondly, while we are typically good around the kids, they have heard bad language and have also been taught that it’s not good to use. I have recently begun telling my littlest ones (2 and 4) that they are not to use those words, that they can make choices to do so when they get older (as in adults) but maybe they won’t want to. As for the teen, she is old enough to choose, and while she doesn’t do it in front of us, I do see some @#$%@$% text messages occasionally. **Last note** I think that we will lose the battle on language in the future, as language breaks down and our youth become even more ignorant of propriety. I have noticed a lot of teens using language that can be downright vulgar, and its interesting, the older I’ve become the more silly it sounds coming out of the mouth of these teenagers. It’s so forceful and unnatural sounding, as if the language is what makes them mature. I’ve explained to my kids that using those words doesn’t prove anything. I’m also really honest (with my son-who is older) and told him that I used to use that language all the time, and I just kinda grew away from it. But your comment, and my past makes me think, maybe this is just a cycle, those kids will grow have kids of their own, watch their language and tell their kids not to curse…I guess time will tell. Thank you so much for adding your comment! Thank you for your article. My daughter isn’t talking much yet, but we are very careful what is said around her. It is something I know we will have to deal with at some point. I enjoy hearing other peoples ideas on this. I’ve really enjoyed the comments too! I’m holding onto my faith with this subject. I feel like we as parents can make a big impact on our kids. I know peer pressure is seeming to get worse, but I gotta keep the faith! Great subject! you never know what they’ll repeat! Thank for taking time Jen! Have a blessed day. My kids have heard language at school and have experimented using it. Usually, innocently. Never an F bomb! But, we talk about the Power of our words and the impact they have on others and respect. So far that has been successful and my oldest is almost 13. Steph, your comment gives me hope! At this point I don’t see it happening either, but sometimes I wonder about the teenage years. I’d like to think we can have a bigger influence over our kids than other teens could have over them. Thanks for sharing with me. I actually just heard a Janet Lansbury podcast on this topic today–check it out! Oh thanks Denaye! I will look that up. I’m interested in hearing what others have to say. Thanks for pointing me towards this resource. My kids are really little so our bad words are “shut up”, “poop head” and the like. But I love your response. I think kids need a little space to figure it all out! AAAHHHH!! This made me laugh so hard! Thanks, we just figured he needs to learn to be assertive, and although we don’t want him hearing or indulging in that language, it’s just the tip of the iceberg in terms of what he’ll be up against as he gets older. Thanks for sharing your thoughts! I’ll admit it – my son has repeated a word I’ve said before. It was definitely a teachable moment for BOTH of us. After a long talk (and tears on my end), we came to a deal to not say those words – either of us. We’ve been good so far. It’s definitely a learning experience! What a great moment for the two of you. I understand the tears, it hurts our heart when they do something that we don’t like, then we realize they were emulating us! Ouch! What a great learning moment. Thanks for sharing, I love it! I could not agree more! My husband and I are very careful with the words that we use…. even discussing the day… If my kids did not behave as well as I liked… we coded it to one another. Oh, I’ve been noticing the wandering eyes and the leaning ears when we talk too! I’m going have to get on this! Thanks for sharing this! I really enjoyed this – my daughter is only 13 months old, so we haven’t had to deal with this yet… I definitely appreciate your approach of allowing it to make it less powerful. Even at 13 months old – by telling my daughter not to do something, just makes her want to do it more. It loses the fun as soon as I let her. So as long as it’s not seriously dangerous I try to allow her to test her own boundaries and figure things out for herself. Stephanie, yes! We’re thinking alike mama- Rather than a long battle of “don’t do that”, just go ahead and get the giggles out. Thanks for stopping by and sharing! Jasmine, you have some time to “perfect” your approach. It’s great that you’re thinking of it now. We need all the time we can get to ready ourselves for the battle. Thanks for sharing your thoughts! We are careful what we say around our 3 year old as he is such a sponge right now. What’s frustrating is having friends with kids who swear all the time because their kids pick it up and now it’s being said around my son. It’s kind of one of those inevitable things though. I try and explain to him that certain words are not ok to use. He honestly seems to get it and doesn’t say things he shouldn’t. I think it’s interesting and wonderful when children trust their parents. I mean isn’t that the goal. To be able to speak to your kids and have them take heed? You’re right, once its out there, we just have to explain and be the example for them. Just continue to do what your doing. Thanks you for sharing your thoughts! My kids are 4 and 2 and I do my best to watch my language and warn others about theirs when my kids are in ear-shot. I do wonder about how I’ll respond when my kids do say a curse word. Because they will at some point! I like the idea of giving them permission to get it out of their system. Emma, I’ve noticed that taking the curiosity out if it really seemed to help. Also, when they say words you really don’t want them to, try to play it off, that way they won’t think “oh, this is how I get a reaction out of them” Good luck! Thanks for sharing! Great article! 🙂 I just had my first child in September and I totally understand. My hubby and I already watch how we talk around him because pretty soon he will be able to repeat what we say, lol.. Thanks for sharing your insight. Latasha, that’s so true. My daughter and has repeated things that my husband and I were speaking about-in hushed tones, in the other room! Those little ears can really pick up so much. Thanks for stopping by and joining in!